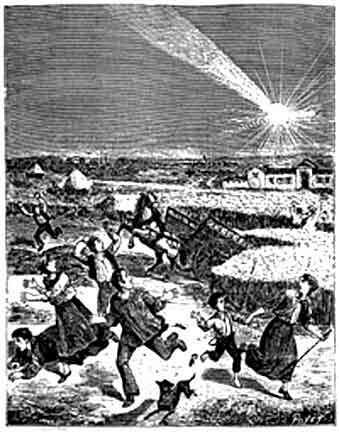 In 1807 a fireball streaked across the New England sky, broke into pieces and scattered over Weston, Conn. The young Yale professor who rushed to the scene of the phenomenon pronounced it a meteorite. Benjamin Silliman's analysis of the Weston meteorite formed the foundation of modern scientific research in America -- despite the skepticism of President Thomas Jefferson. A fanciful contemporary woodblock print of the Weston meteorite. The idea that rocks could fall from space was only recently accepted in Europe by a handful of chemists and mineralogists. Then in 1803, a huge meteorite shower in L’Aigle, France, forced more scientists to concede it could and did happen. New Englanders had seen meteorites before. But more witnesses saw the Weston meteorite and documented it more thoroughly than any previous meteorite that flew over the region. The Weston meteorite was a huge stroke of luck for the 29-year-old Silliman. Benjamin Silliman was born on Aug. 8, 1779 in a tavern in Trumbull, Conn. His mother, Mary Fish Silliman had fled British forces that invaded and burned her hometown of Fairfield, Conn. The British had captured her husband, Gold Selleck Silliman. Benjamin Silliman earned a B.A. and then an M.A. from Yale. He was teaching chemistry and natural history at the college when the Weston meteorite fell on Connecticut. 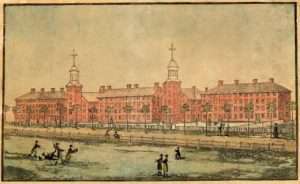 Europeans then considered the college, along with every other American educational institution, a backwater of scientific thought. At 6:30 a.m. on Dec. 14, 1807, a red ball of fire about two-thirds the size of the full moon was seen by witnesses from southern Vermont to Fairfield County, Conn. They heard three loud booms followed by a rumbling like a cannonball rolling along a wooden floor. Witnesses heard a whizzing sound near the six places where the meteorite fragments fell. Most of the fragments fell in parts of Trumbull, Conn., and what is now the town of Easton, Conn., then Weston. From Albany to Fairfield County, the Weston meteor frightened farmers, milkmaids, schoolchildren and horses. Judge Nathan Wheeler was taking his daily walk across his land in Weston when the sky lit up his house, his barn, his trees and his stone walls. Dr. Isaac Bronson was traveling along the Boston Post Road when the inside of his stagecoach lit up and rocks clattered on the roof. In Rutland, Vt., William Page looked up from his doorstep and saw a meteor heading south, leaving a ‘vivid, sparkling train of light.’ A Mrs. Gardner watched it for 30 seconds from her bedroom window in Wrentham, Mass. 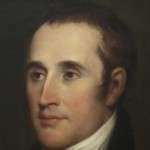 When his friend Isaac Bronson told him about the meteorite, Benjamin Silliman dropped everything and bolted for Weston. He brought his colleague, classics professor James Kingsley, because of his skill at interviewing and writing. Silliman and Kingsley immediately ran into trouble. The townsfolk of Weston were selling the Weston meteorite, piece by piece. Members of the William Prince family, for example, dug up a large fragment in their yard. They smashed it into fragments and sold it off. The two professors did manage to collect meteorite fragments, interview witnesses and map the fall sites with help from the townspeople. Silliman was excited to discover in the stones round grains, or chondrules, which he knew weren’t present in earthly rocks. He published his conclusion that the fireball had fallen from space in the Connecticut Herald on Dec. 29, 1807. He estimated the meteor to be a half-mile in diameter and to have traveled at a rate of 200 or 300 miles a minute. The sensational story about the ‘terrestrial comet’ spread as other newspapers copied it. The discovery was deemed so important that another version of Silliman’s work was read before the Philosophical Society of London and in the Academy of Sciences of Paris. When told of the Yale professors’ theory, Thomas Jefferson is said to have ommented derisively. "It is easier to believe that two Yankee professors could lie than to admit that stones could fall from heaven," the president allegedly said. And, he concluded, "it has been remarked that whenever any stones fall from the moon, the greater part of them is sure to tumble into New England." To defend his conclusion about the Weston meteorite, Silliman founded the American Journal of Science. As one of the preeminent scientists of his age, he distilled petroleum, the first to do so. His son, Benjamin Silliman, Jr., also taught chemistry at Yale and played a large role in developing the petroleum industry. You can see fragments of the Weston meteorite at the Yale Peabody Museum of Natural History. They stand out as the first catalogued objects in the Yale meteorite collection, the oldest in the United States. 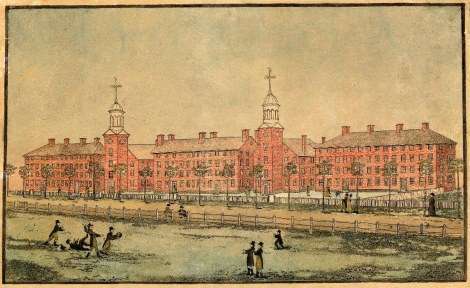 With thanks to A Professor, A President, and A Meteor: The Birth of American Science By Cathryn J. Prince. This story about the Weston meteorite was updated in 2017. Yeah, he wasn’t fond of Yankees was he? We learned about this in my astronomy class this past semester. great article, if anyone wants to read more on meteorites you can find many articles here: https://www.howardites.com/history/ we add articles all the time so please feel free to browse. Our site https://www.howardites.com/ is a meteorite related site packed with educational material.